The Landestheater Salzburg is a theatre in Salzburg that is funded (or subsidised) by the federal province of the same name. This makes it the "official" theatre of Salzburg, even though there are several stages in the city that are bigger, smaller, more innovative, more conservative or whatever - Salzburg is full with cultural life and drama is no exception. Essentially all productions of the Landestheater are in German - so why then bothering to mention it here at Visit-Salzburg.net? 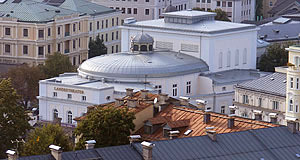 For two reasons: Firstly, we think that the prominent building in the city centre itself makes an attraction that might receive some interest from international visitors; secondly, because this website aims to point international tourists towards local culture, too, and not only to tourist attractions. The Landestheater can be found on the Markatplatz, facing the Mozart living place and Doppler birthplace. The area where the Landestheater stands was carefully chosen for a theatre: Plays and concerts have been performed here for centuries. In 1625, the Ballhaus (a facility for playing ball games) was built here. The two playing statues at the entrance of the Mirabell Park refer to this facility. In 1775, Prince Archbishop Hieronymus Franz Josef von Colloredo-Mannsfeld replaced the Ballhaus with the first Court Theatre of Salzburg. It quickly became one of the most influential theatres in Central Europe, early guests included the Mozart family. In 1784, the first Mozart opera was performed in this processor of the Landestheater. With the secularisation of Salzburg, the Court Theatre lost its role. It was not until the later 19th century that Salzburg′s economic recovery allowed the construction of a new theatre - the current Landestheater. Today, the Landestheater is the most important permanent facility for drama in Salzburg. It offers 1,000 seats and is operated in annual seasons with summer breaks. During the Salzburg Festival, the Landestheater is used as a stage for drama. The Kammerspiele are a smaller stage that is associated with the Landestheater; it was opened in 1971, alongside with the Salzburger Marionettentheater. The program of both stages is a combination of drama, opera and dance. For music productions, the Landestheater often does Mozart operas - however, it is by no means a touristy enterprise or a Mozart-stage. Other focus areas include, for example, contemporary Austrian playwrights. The Landestheater has its own ensembles for acting, opera and ballet; the orchestra is the Mozarteum Orchester. Students get discount tickets at very reasonable rates 30 minutes before the beginning of a performance.